Esports is one of the fastest growing - and most cutthroat - industries in the world. A confluence of technology, culture, and determination has made this possible. Players around the world compete for millions of dollars in prize money, and companies like Amazon, Coca-Cola, and Intel have invested billions. Esports events have sold out Los Angeles' Staples Center, Seoul's World Cup Stadium, and Seattle's KeyArena. Hundreds of people have dedicated their lives to gaming, sacrificing their education, their relationships, and even their bodies to compete, committing themselves with the same fervor of any professional athlete. In Good Luck Have Fun, author Roland Li talks to some of the biggest names in the business and explores the players, companies, and games that have made it to the new major leagues. Follow Alexander Garfield as he builds Evil Geniuses, a modest gaming group in his college dorm, into a global, multimillion-dollar eSports empire. Learn how Brandon Beck and Marc Merrill made League of Legends the world's most successful eSports league and most popular PC game, on track to make over $1 billion a year. See how Twitch pivoted from a video streaming novelty into a $1 billion start-up on the back of professional gamers. And dive into eSports' dark side: drug abuse, labor troubles, and for each success story hundreds of people who failed to make it big. These are the stories of the rise of an industry and culture that challenge what we know about sports, games, and competition. 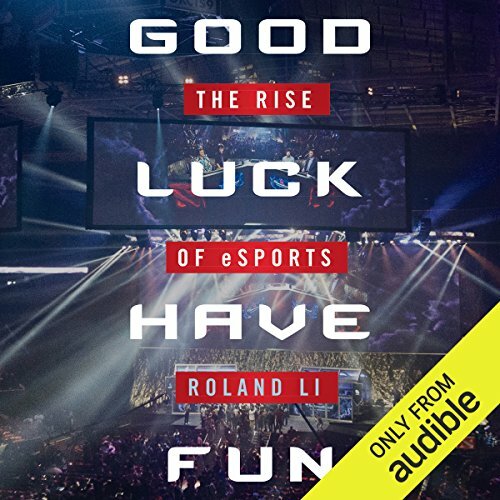 ©2016 Roland Li (P)2016 Audible, Inc.
Roland Li's book is an amazing documentary about the rise of Esports over the last 15-20 years. It follows many of the major players and personalities of the biggest esports and offers a lot of interesting behind the scenes infos and input from some of the indutry's most influential personalities. It especially focuses on the path of Alex Garfield and outlines his heavy influence on many parts of the industry. Games-wise, it predominately features Counter-Strike, Broodwar, Starcraft 2 and DotA 2, but also touches on other games and their players. My favourite chapter was the really detailed one about the history of streaming and Twitch.tv, which is very well documented in Li's work. The chapter about the role and challenges of women in esports was also another very welcome addition to this book.